A beautifully shot and uniquely crafted film. Director Dee Rees weaved a multi-faceted and multi-layered story interlaced with alternating POVs of the main characters like chapter divisions in a novel. 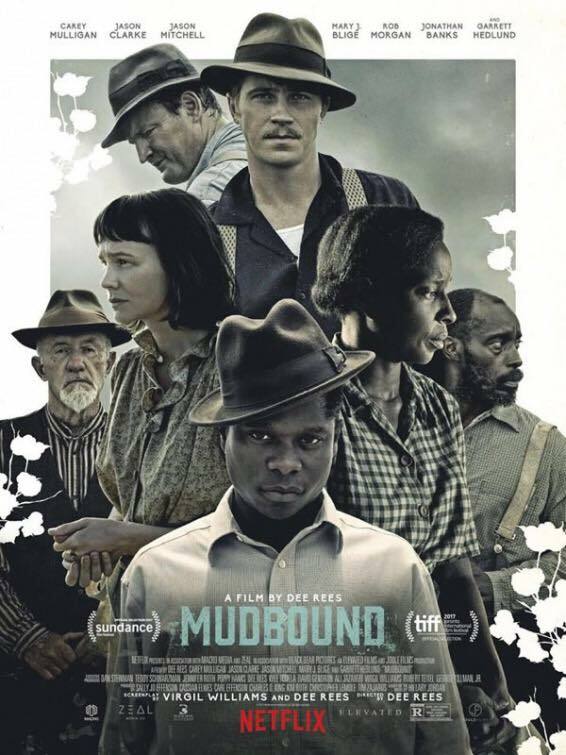 The film explored a myriad of themes from race and class division, family vs self, post-war PTSD and place in society, and ignorance and inaction vs responsibility and guilt; but for all its ambitions, "Mudbound" could not sustain the juggling act and some stories fell to the side. However, the most important of which - racial politics - was powerfully told and climaxed in an heart wrenching third act. And Dee Rees was the director to tell that story, in particular this less often told period of American history: the changing of generation and evolving attitudes and the conflict within family towards the change. A complex story with complex characters, simply told. Mary J Blige was a standout with a strong, restrained performance; Jason Clarke and Carey Mulligan were as usual reliable and more than competent; Garrett Hedlund and Jason Mitchell were pleasant revelations. Rachel Morrison - as aforementioned - lensed this film utterly beautifully, regardless whether by candlelight or the gorgeous dusky sun of the Mississippi delta.